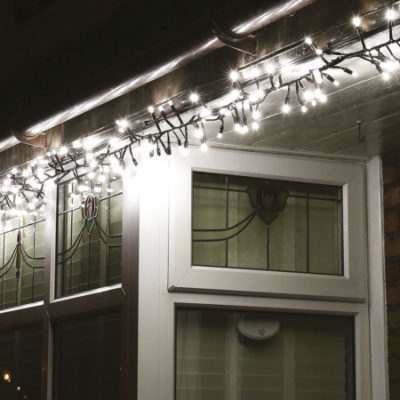 You’ve purchased your lights for your outside display, now how do you begin to install them? If this is your first time in the world of lighting (especially connectable lights) then it can be a little confusing to begin with. Follow our guide below for an easy way to hang Christmas lights on a house, and you should be fine! To begin with, we state with all of our outdoor lights that the plug should either be plugged indoors, or in a weatherproof outdoor socket. If you do need to use a plug socket indoors then don’t worry, as most cables can easily be run through a window or door. This depends on the cable being thin enough to ensure that the window or door can still be closed and locked with the wire running out (our low voltage connectable lights are usually suitable for this). 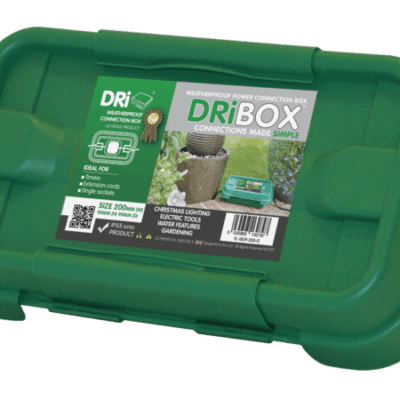 If you need to run a number of plugs, and sockets are unavailable, you can house plugs and gangs in our weatherproof dri-box range, which can be left outside permanently. 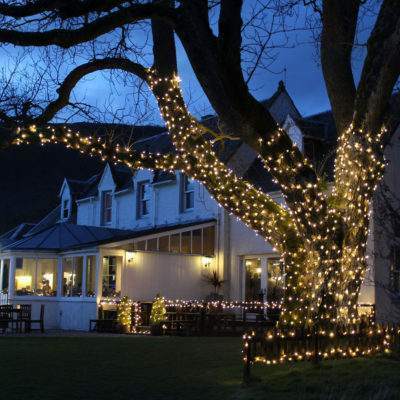 How do you install Christmas lights on a tree? This is probably the easiest of assemblies when it comes to installing lights outdoors. 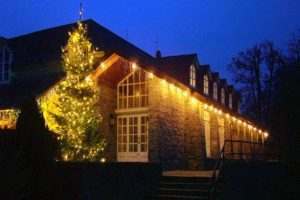 Our connectable range are normally the lights that we recommend, as you can just connect each light string together as it runs up the tree. You can also easily add or detract from your display, editing it until it is the perfect length possible. There are a variety of ways in which you can choose to decorate the tree, and the installation options may well depend on the tree type or size. 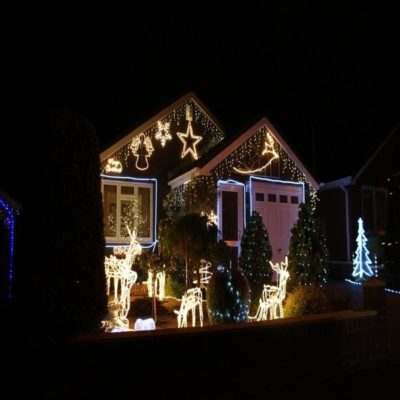 How do you install Christmas lights directly onto a house or roof? 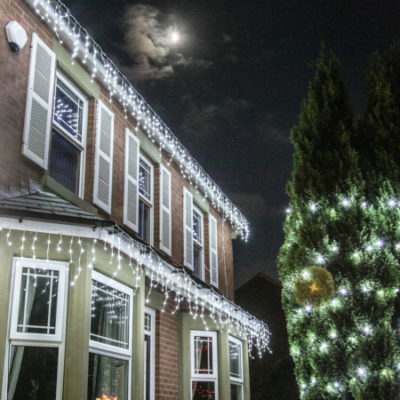 Installation on a house or roof can take longer to implement, as the lights need to be fixed more securely in place, rather than just being wrapped around a tree. Again the plug will need to be plugged indoors in most cases, so running the cable through a window from the plug is generally the most common method here. In fact we have a wide range of accessories that can help you install, from wire suckers to different connectable choices. 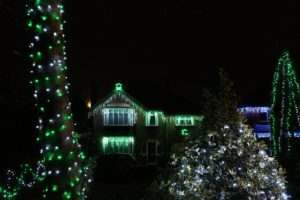 We have now created a specific guide to installing lights on a house, again featuring some instructional videos, so that you can see the different options available to you. We would also stress that if you’re not totally confident and comfortable doing this yourself, there are local professionals that you can hire to put lights onto your roof or elsewhere on your home. 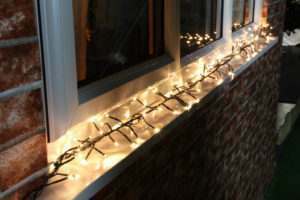 How do you put Christmas lights around outdoor windows? This is actually among the more simple outdoor lighting tasks. 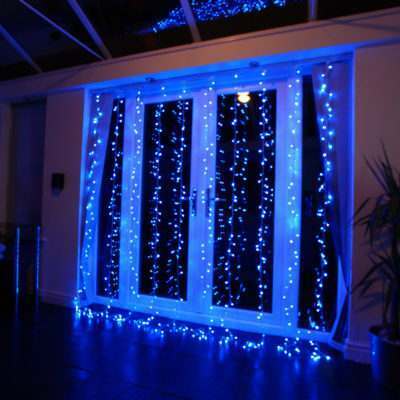 You can use fairy lights around the perimeter of a window, or icicle or curtain lights hanging from the top of the window. The former is something that we cover in our guide to installing lights on a window guide, which also features a handy instructional video. How do you store your lights? And finally… make sure you look after your lights over the summer months! We recommend placing them back in the box they arrived in, coiled up neatly to avoid the frustration of untangling them next year. Although all outdoor lights are waterproof, we would recommend a dry, cool place to keep them in tip top condition and prevent any moisture creeping in. With a little bit of TLC they should last you for years to come. 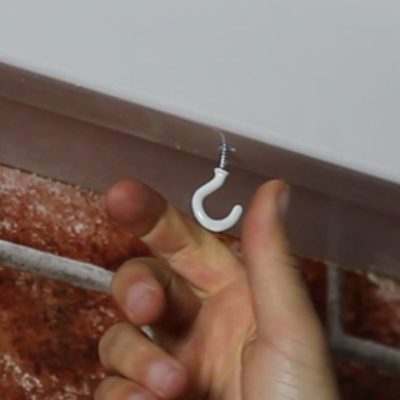 Hanging Your Lights Using Hooks?